Since time immemorial the oak has been a symbol of loyalty, strength, generosity and renewal. Peter Young explores how this tree, native to the northern hemisphere and found in locations as diverse as the Americas and tropical Asia, has played an important role in state-building, art, folk tales, poems and songs. Early societies venerated the oak: it was understood to be a gateway between worlds in Celtic mythology and later became sacred to Thor in Norse mythology. In modern times it has been adopted by many European countries as a national symbol, including England, France, and Germany. The United States Congress identified the oak as America's national tree in 2004, and it is the designated official tree for six American states. Individual oaks have historic importance, such as the Royal Oak in England, which concealed Charles II following his defeat at the Battle of Worcester in 1651, and the Charter Oak in Hartford, Connecticut, which became a symbol of American independence. 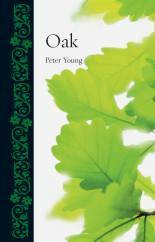 In addition to tracing the history of the tree itself, Young investigates the use of oak in making furniture, bridges, wine casks, homes, ships, weapons, and even the electric chair, and he describes how the oak has been used as a food source � its fruit, the acorn, was eaten in ancient Greece, ancient Iberia and Korea, and it was a traditional food of Native Americans. Packed with information and beautiful illustrations, Oak is the fascinating story of this stately, durable member of the natural world. 208 pages. 50 colour, 90 b/w photos and illustrations.